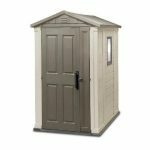 Offering you all the storage you could ever want, the 10’5 x 13′ Duramax WoodBridge Plastic Shed is one of the most impressive looking sheds that you will ever see. 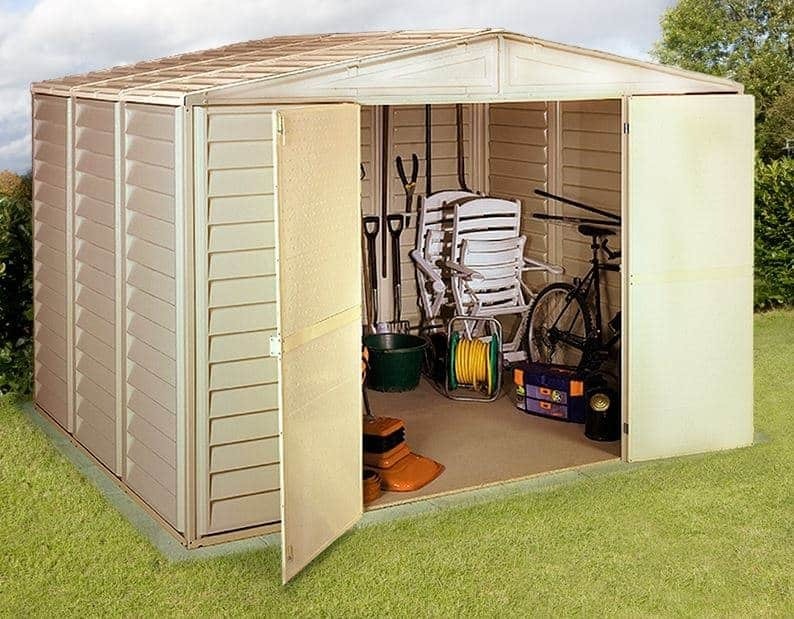 With its fantastic modern look this is a shed that is going to not only provide you with a lot of storage space to keep your belongings safe from bad weather or thieves, but it is also going to be a major stand out feature in your garden. This kind of storage space is amazing and it is so large that the shed could actually be used as a workshop. To make this a shed that is very easy to use there are two very large double doors that make getting things out and putting them back very easy. A huge part of what gives this shed its modern look are the state of the art materials that have been used in its construction. Duramax have used their, high quality and very durable PVC cladding which cannot only stand up against extreme weather conditions, but is also fire redundant. A stylish apex roof will keep the rain out of your shed, but also look fantastic in the process. This is a shed that is both great looking and very practical. 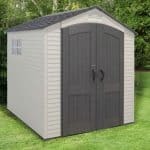 When it comes to large sheds that offer just a huge amount of storage space and that are pretty easy on the eye then you will certainly struggle to find a shed that delivers such a strong first impression as the 10’5 x 13′ Duramax WoodBridge Plastic Shed. When you finish installing this, take a step back and look at it, you cannot help, but be truly amazed at the size of this shed. It is an incredible, 13 feet deep and 10 feet 5 inches wide. The amount of room you have inside here is just amazing and we are sure that no matter what you intend to use this shed for that you will have more than enough room at your disposal. We were very impressed with the headroom available inside here. Too many sheds these days force you to sort of hunch over to move around inside. Well with a ridge height of 7 feet 1 inch that is not going to happen inside here. Even the lowest point at the sides of the shed is 6 feet 1 high. For the roof of the shed, Duramax have utilised an apex roof that is done in the same ivory colour which the rest of the shed is. We love the design of these roofing panels and while the apex style is there to ensure no rain can get inside we are very pleased with how instead of just making them flat, Duramax have given them a little bit of style by making the panels similar to how the walls look. It is a very cool effect and one that just helps add to the overall great look of this shed. This is a shed that is made from plastic, (actually plastic makes it sound very cheap) but it is more than just a basic plastic. The walls of the shed are made from this very high quality, weather proof, fire redundant PVC cladding that has a very nice style to it and also is incredibly strong. We are sure that these walls are going to be able to take a lot of abuse over the years which makes the shed great if you have kids playing in the garden or if you are known to crash the mower into the shed from time to time. The framing of the 10’5 x 13′ Duramax WoodBridge Plastic Shed really did impress us. One thing that we really love is a strong frame as this is what is going to hold a shed together and make sure it is in it with you for the long haul. Well that amazing, PVC cladding is supported with an incredibly strong steel frame that is going to last for lots of years and keep the shed in great shape. For the floor, Duramax have gone with some good and sturdy flooring that will certainly feel secure under your feet. One thing we want to mention is that you can actually buy this shed in a Shed Only form. 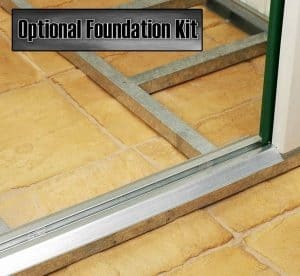 This means that you would get the shed without a floor and then you could bolt it to a concrete floor with the steel foundation kit which can be purchased separately. There is no treatment that you have to paint the shed with once a year. You do not have to ever reseal or touch up anything. This shed once built requires nothing from you and that is something we think is just fantastic. As great and low maintenance as the shed is it still is not going to grow arms and clean itself so you will have to get the sponge and a bucket of water out if you want to keep the dirt off, but that is all you need to do and even then if you do not mind a dirty shed then you do not even have to do that. 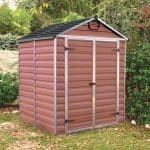 This is one strong and durable shed that is going to last you for lots of years. To show how sure they are of this, Duramax offer a ten year guarantee. You have a great set of double doors on this shed to make moving everything into the shed easy as can be. We love a good set of double doors and with a height of 5 feet 11 inches and a width of 5 feet, you will be able to get pretty much anything you could think of in and out very easily. As standard there are no windows included with the 10’5 x 13′ Duramax WoodBridge Plastic Shed. 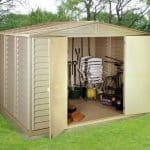 This is one very secure shed and we have no doubt that anything you place inside here will be kept safe from the weather, but if you do want to add some real security then this can be done easily and cheaply. All you need is a padlock which can go on the door to keep it locked and it will cost you no more than a pound as well. You will have a lot of privacy with this shed which is great if you have some rather expensive things inside that you do not want people to be able to see through a window. With the doors closed and if you decide against adding windows there is no way for anyone, no matter how nosey they may be to look inside. 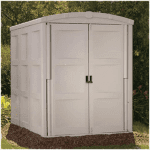 The shed is a very lovely ivory colour which will fit into pretty much any style of garden. This is something we are pleased with as this is the only colour that the shed is available in and the materials that it is made from are not suitable for customising. There are a few extras that you can choose with this shed. First of all there is a window kit. The window kit costs an extra £70 and will allow you to add an acrylic window to the shed. Now please note, you will have to cut the PVC cladding yourself to install the window. 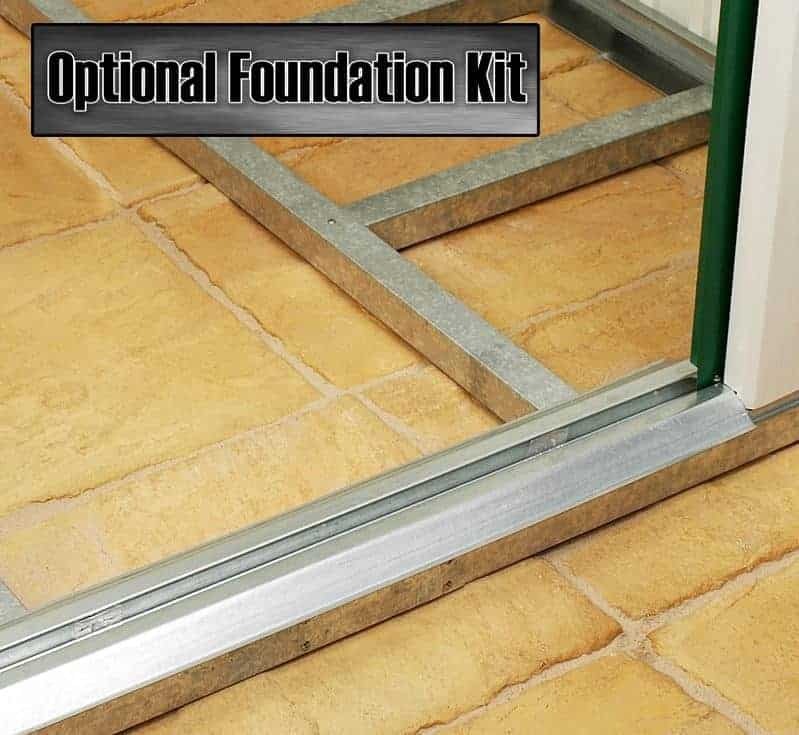 As well as this there is the steel foundation kit which can be bought at cost of £199.99 and is what you need if you plan on building the shed directly onto concrete without adding a floor. Look we know that plastic and high quality do not normally go together, but we really are amazed at just how high quality the plastic materials of this shed are. This shed has been very cleverly designed so that it is going to last you a lot of years. One awesome thing about this is just how little you have to do in order for it to last all those years. This is one huge shed and at 10.5 X 13, you are going to have all the space you could need. You will need a good friend to help you build this, but this type of PVC for the most part will slot together and you should have this done in a few hours. Final Thoughts: We are very impressed with how high quality and good looking the 10'5 x 13' Duramax WoodBridge Plastic Shed turned out to be. The PVC cladding is far more sturdy than we initially thought and with that steel frame behind it, you are going to have a shed that could easily still be standing just as strong and looking just as good 20 years from now. 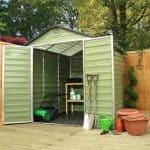 It offers you an incredible amount of storage and in all this is just a fantastic shed in every regard and one that we feel would meet the needs of anyone looking to add a lot of storage space to their garden.